We love coffee and really do enjoy supplying you with this wonderful product. 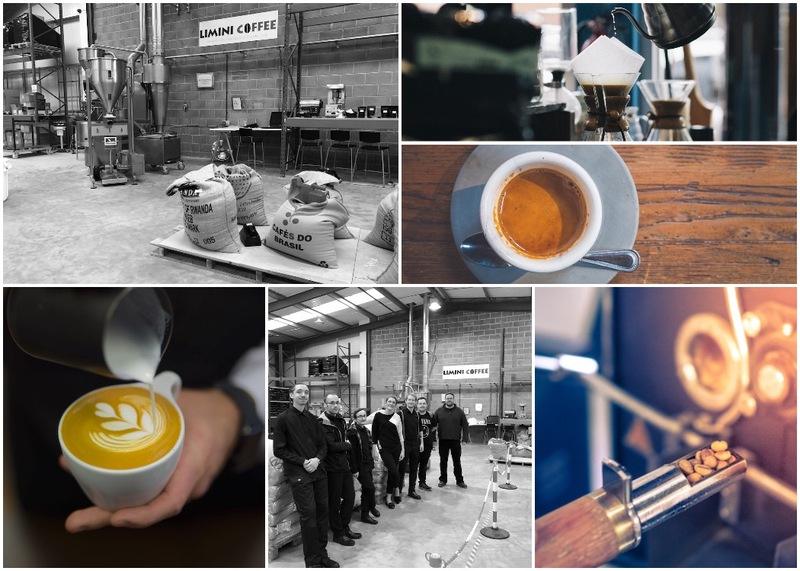 We source, develop and roast coffees from all over the world. Flavoursome, smooth and aromatic coffees that are a real pleasure to brew. No account needed to order with us. Do you order for your business? Then please sign up to benefit from bulk pricing and an extended product range. We aim to dispatch same day for next day delivery. Delivery is free for orders over £50 and orders under the free delivery amount will have a small delivery charge which will be calculated at checkout. Any orders outside of UK mainland can incur an extra cost - if this is the case then we will contact you asap. 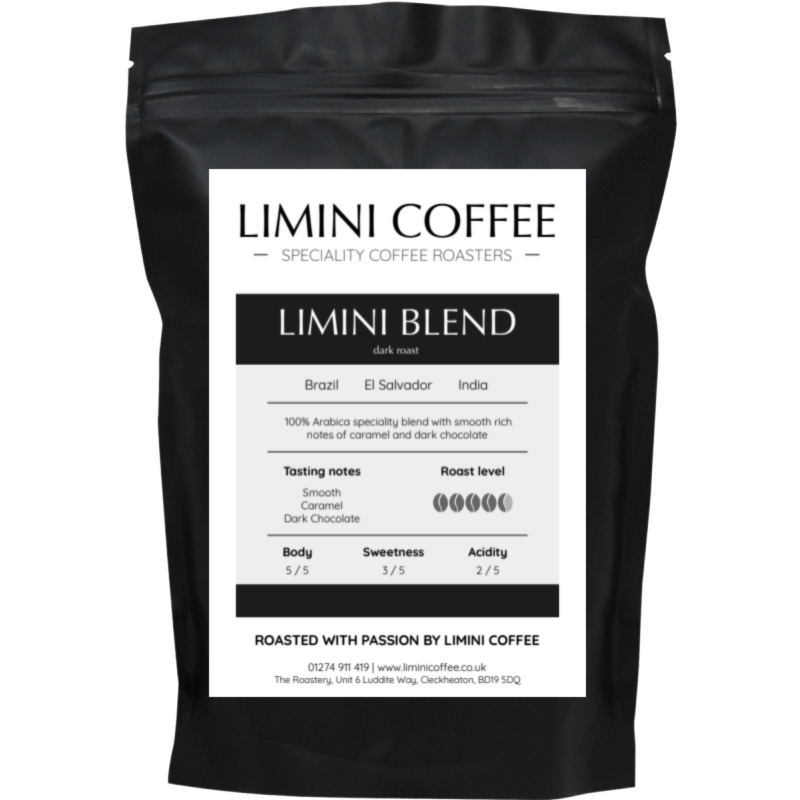 This blend started the journey of Limini Coffee years ago and is enjoyed by many coffee outlets and coffee fanatics at home. It took weeks to develop this blend, lots of roasting, tasting and adjusting of the roast profile and the components. What a job right?! It was really fun to do but also very important as we wanted this to be our signature blend. Over the years we have kept it consistent - a full bodied smooth coffee without bitterness and with a hint of caramel notes and dark chocolate. We started the blend design with the Brazil which is a great base and a beautiful coffee on its own. The Brazil is smooth and mellow with a good sweetness and notes of chocolate. To complement we added our El Salvador coffee which added a juicy sweetness and delicious notes of caramel. To calm the acidity down and to add even more body we used a special coffee from India. This coffee from India is from Malabar and is aged - a so called monsooned coffee. The Indian coffee has been exposed to monsoon winds for about six weeks - this makes it very unique in flavour and adds a huge body. Excellent as we are looking for as much body as we can. The result is a coffee with lots of body, a beautiful sweetness and not too much acidity. 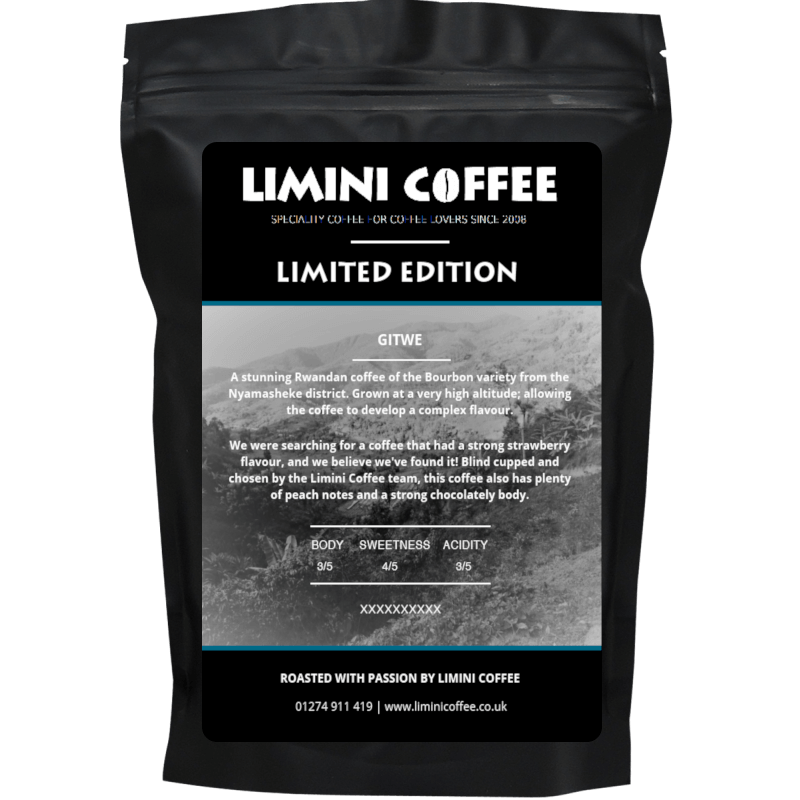 The Limini Blend is a medium-dark roast dropped just before the oils come out. Because of the blend design and the way it is roasted it works great with larger amounts of milk. This coffee really shines as a cappuccino and a latte. Also really beautiful as a ristretto - the shorter the better almost to really bring out the caramel notes. A slightly darker roasted version of our Limini Blend. This is a stunning blend. A medium roast to ensure you have all the sweetness yet dark enough to enjoy this blend with milk. It is a simple blend design with just two amazing beans which will make the blend very consistent throughout the bag. Beautiful cappuccinos and lattes with real chocolatey notes. As an espresso you get a hit of sweetness followed by nutty notes. It is the sweetness and the nutty characteristics that make this coffee so special. This is a beautiful blend of South and Central American coffees that is very easy to work with. The Brazil in this blend is designed to be the base and helps with the nutty notes. The Guatemala makes this coffee sweet and a little chocolatey. You can also use this espresso blend to brew filter coffee. We would recommend either the V60 pourover or the Aeropress. A deliciously medium roasted espresso blend that delivers sweet coffees with a soft acidity and a big body. Liscio has sweet ripe fruits notes, a slightly bright coffee that still works with plenty of milk. This is a fantastic coffee that is versatile and sweet, perfect for those who like a complex shot. The Brazil is doing a lot for the body whilst the Costa Rica gives all the fruit notes that we like in this blend. The Costa Rica also adds to the brightness and brings the coffee alive. The Indonesian helps with making the body bigger, controls the acidity a little and ensures that the coffee works well with milk. As a milk based coffee, Liscio is smooth and mellow with sweet vanilla and milk chocolate flavours. This is a 100% chemical free decaffeinated coffee using the swiss-water decaffeination process. 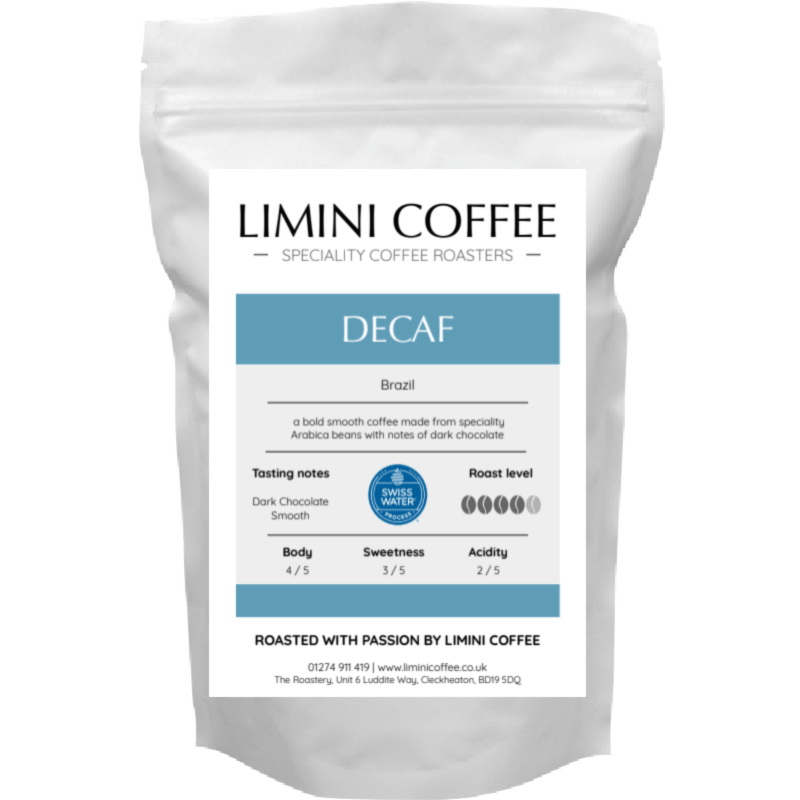 Our decaf is from Brazil and has been carefully sourced to ensure the coffee is smooth and consistent throughout the year. You can use this coffee through the espresso machine and we can grind this for you; although we recommend to grind fresh for each coffee. Medium bodied with nutty notes. A stunning Rwandan coffee of the Bourbon variety from the Nyamasheke district. Grown at a very high altitude allowing the coffee to develop a complex flavour. We were searching for a coffee that had a strong strawberry flavour and we believe we've found it! Blind cupped and chosen by the Limini Coffee team, this coffee also has plenty of peach notes and a strong chocolatey body. A Blue Mountain blend is often a design by a coffee roaster to emulate the famous Jamaica Blue Mountain coffee. This is our version. We have blended speciality beans from Brazil and El Salvador and roasted it in a way to bring out the natural sweetness. This is an easy smooth drinking coffee that we are very proud of. One of our favourite coffees here at Limini. This coffee highlights to us how delicious Ethiopian coffee is. It is wild, winey and yet full bodied. It is similar to our Ethiopian Yirgacheffe coffee but not as floral. Our Limu is grown about 1600 masl in the Oromia region of south west Ethiopia and is a mix of coffees from just six farms. This coffee from Negele Gurbitu comes from the Yirgacheffe region which is a famous coffee growing region in Ethiopia. Grown very high up around 1700 to 2000 meters, this coffee has been harvested between October and December and is fully washed. These coffee trees are of the fantastic Heirloom variety. Expect really funky and floral flavours; think of Earl Grey tea and whisky. Colombia is one of the finest coffee growing countries in the world. Being the third largest grower of coffee, Colombians know what they are doing and have been doing so since 1790. This supremo coffee from Colombia is chocolatey and nutty and we source it from Medellin. A delicious mild coffee as a filter and sweet and slightly bright as an espresso. This coffee is fully washed delivering clarity and a healthy brightness in the cup that can be enjoyed in large quantities anytime of the day. Guatemala has been growing coffee since the 1850s and is one of the top producers in Central America. Coffees from Guatemala are simply beautiful and one of our favourite here at Limini. Our Guatemalan coffee is from plantations in volcanic valleys surrounding Antigua. This coffee is surrounded by three volcanoes: Agua, Fuego and Acatenango. The plantations have rich volcanic soil and excellent growing conditions at an altitude of 1650 metres. This coffee is chocolatey and sweet with a beautiful body. There are notes of blackberries in the aroma. Delicious. A beautiful coffee from the famous coffee growing region of Cerrado Minas Gerais. Brazil is the largest producer of coffee and sets standards for the quality of growing, harvesting and processing of amazing coffee. Brazilian coffee is usually a very balanced coffee and is therefore often used as a base for many blends. This particular coffee is mild and easy to drink. Excellent as a filter coffee so try this in a V60 or Aeropress. This is a naturally processed coffee which delivers a smooth mild drink with notes of nuts. Our coffee from El Salvador is from the Las Isabellas farm and is a mixture of Pacamara and Bourbon. Las Isabellas is located in the south face of "Cerron Grande" of Apaneca at the west region of El Salvador at an altitude of 1200 to 1450m. At Las Isabellas you can find 175 acres of natural forest, natural springs and waterfalls! Las Isabellas is a certified Rainforest Alliance farm. The owner of the farm is Jose Roberto Santamaria who is dedicated to managing the farm and the mill. Sweet mild coffee with delicious flavours of plums and chocolate. Rwanda might be small but the coffee that comes out of this African country can sometimes be nothing but absolutely divine. As Rwanda has no coastline it can be expensive to export the coffee. There are some 400,000 small-scale growers and all coffee is Arabica. Our coffee, which is grown at 1,400 - 1,900 meters, is from the varieties Bourbon and Typica and is a fully washed mix of coffees from 40 washing stations and 35,000 farmers in Rwanda. The coffee is hulled, graded and hand sorted at the Rwanda Trading Company in Kigali. This is a fruity and well balanced sweet coffee with beautiful hints of cranberries. Indonesia is one of the largest coffee producers in the world, usually in the top five. Coffee growing was started during colonial times around 1696 as the region provided some excellent growing conditions. Coffees from Indonesia produce low acidity and high bodied profile. This coffee is grown near Lake Toba which is the largest volcanic lake in the world. Processed using Giling Basah, this coffee has a huge body and a spicy aroma with hints of tobacco.